Five years ago, the duo of JJ Project, a subunit of chart-topping boy band GOT7, were not so different from other 18-year-olds, as they galloped on stage with their upbeat hip-hop debut single “Bounce,” full of energy. 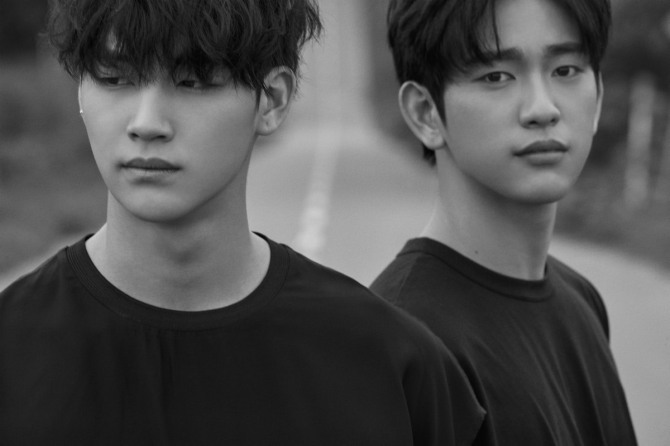 Likening their past to innocent children, JB and Jinyoung, both now in their mid-20s, said they wanted to showcase the more toned down and mature sides of themselves in their latest autobiographical album “Verse 2,” which was released Monday. “At first, we were concerned whether the public would approve of ‘Tomorrow, Today,’ the lead track of our new album, since the song is completely different from our previous hit ‘Bounce,’” JB told The Korea Herald in Seoul on Tuesday. JB and Jinyoung originally debuted as JJ Project under JYP Entertainment with “Bounce” in May 2012. Two years later, they were incorporated into GOT7, which debuted in January 2014. The duo’s latest album marks JJ Project’s first musical project since “Bounce,” its first, and only, release. “But after we performed both ‘Tomorrow, Today’ and ‘Bounce’ at yesterday’s media showcase, we realized that our choice of the new lead track wasn’t wrong at all,” JB added. Indeed, JJ Project’s new album bodes well for the pair, who are also GOT7’s two main vocalists, as it went on to top iTunes World Album charts in countries including Thailand, Vietnam, Singapore and Malaysia upon its release. The pair said the lead track of the latest album, co-written by themselves and Park Jin-young, the founder of the label and the duo’s producer, features coming-of-age stories of the two in a more laid-back style. Kicking off with a catchy percussive beat and leading into harmonious melodies, “Tomorrow, Today” features lyrics that are more personal and intimate than JJ Project’s previous efforts. The number talks about the struggles of 20-somethings. The pair sing phrases such as “Is it this way? Or that way?” “So tell me which way to go” and “Today I hesitantly answer the questions again that I don’t even know the answer to,” through which they portray fears of young people who have to make choices that will affect their future and potentially take them down any number of new paths. The accompanying vibrant music video, also in line with the song’s message, shows JB and Jinyoung traveling in an old car, as if searching for their paths. The video closes with the two reading books such as J.D. Salinger’s “The Catcher in the Rye,” a quintessential book for rebellious youth, before swapping the books in the end. “For me, JJ Project is like a house, where you can let your guard down and become more honest and emotional. On the other hand, being with GOT7 is more like being with your close friends, and I become more hyped up and bouncy with the group,” Jinyoung said. Hinting at a GOT7 comeback, JB and Jinyoung also shared that they feel somewhat burdened by their activities as a duo without the rest of the band. “Since we kind of represent GOT7, it’s true that we feel burdened and sorry for the other members who also could have debuted as a duo,” said JJ Project. Asked which GOT7 members they would pair up with for the next duo, Jinyoung named BamBam and Yugyeom, adding that Jackson and Youngjae would be a good team as well. 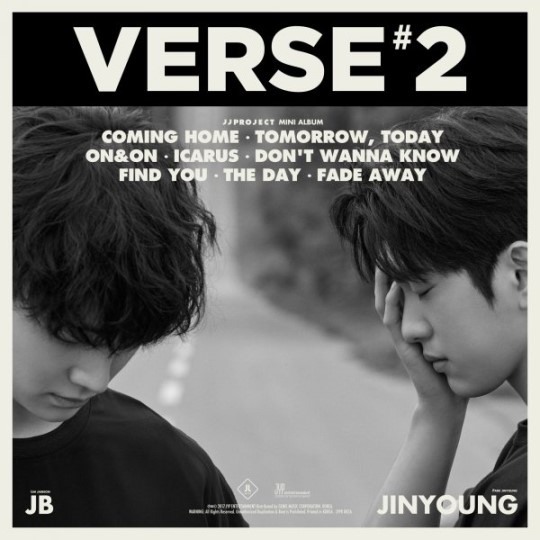 All eight tracks of “Verse 2,” including “Coming Home,” “On&On,” “Icarus” and solo songs by each member, feature lyrics written by JJ Project.